Aloe Vera is very popular plant and is one of the easiest houseplants to grow and care for. You can purchase Aloe Vera products like Aloe Vera gel, Aloe Vera juice, Aloe Vera skin products range and lots more from the market but if you have Aloe Vera plant at home than you can get the fresh Aloe Vera gel any time. Aloe Vera can easily be grown at home as it is highly adaptable in nature and grow upto the height of 1.5 meters (almost 5 feet). Read our experts' tips on how to grow Aloe Vera plant indoors/home mentioned below. . Things need to grow Aloe Vera plant: To grow Aloe Vera plant you need one pot or container with drainage hole in which you want to grow your plant, Aloe seed or stem of Aloe Vera can be bought from any local nursery, soil, manure or soil enrichment products, gardening tools like Spade, watering can etc. Best climate to grow Aloe Vera plant is dry and arid one. It needs bright sunlight to grow well. It cannot survive in very cold region as it is very prone to cold shock and frost damage. 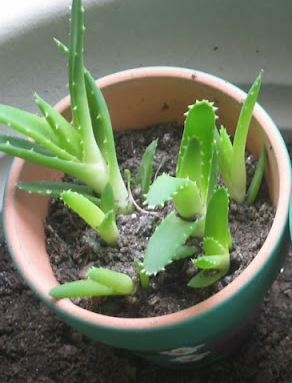 Method to grow Aloe Vera plant: It is very easy and fast process to grow aloe Vera in a pot. Put 1 to 2 inches of gravel for base in a pot for proper water drainage than put 1 to 2 more inches of soil followed by the seeds or stem and cover them with 2 to 3 more inches of soil. You can manipulate the amounts of soil and gravel according to the size and shape of your container. Lastly water your newly potted Aloe plant and place it in a sunny window or balcony so that it can receive maximum amount of light. Watering Aloe Vera Plants: Do not overwater your Aloe plant it is best to water the aloe plant as soon as you notice that the soil is dry. About 1 to 2 cups of water is sufficient for the plant. During winter Aloe plant do not require water daily you can water the aloe plant once in a week. Do not allow water to set on Aloe Vera leaves as it can damage them. It is very easy to take care of an Aloe Vera plant as it requires bright sunlight, heat and very less amount of water. -	Aloe Vera Place plant should be placed where it gets sufficient amount of sunlight and heat. -	Do not over-water your plant as it can destroy it. Water it only when you see the soil of pot becoming dry. -	Though is it very much resistant to many plant insects and pests but always look closely at stems and leaves for any signs of insects or disease. -	Use fertilizes once in a year with a 10-40-10 fertilizer. Do not use very strong fertilizer. -	Do not put Aloe Vera plant in very cold. -	Aloe Vera plants can be toxic for small animals so be cautious and aware of plant placement. -	Aloe Vera is the most natural ingredient to keep your skin young, glowing and youthful. You can apply freshly extract Aloe gel (or purchased from market) directly to your face after cleansing in the morning and before bed to get rid from blemishes, tanning and tired skin. -	To get immediate relief from sunburn apply Aloe Vera gel on it. -	Aloe Vera gel can do wonders on acne prone skin by removing excess oil from skin. -	To get thicker and longer eyelashes apply tiny amount of aloe vera gel to eyelashes at night before going to bed. -	Aloe Vera gel can be used to get rid from dandruff problems, just apply it on your scalp and leave it for 15 minutes before washing your hair repeat this process before each shampoo to get dandruff free hair. -	Aloe Vera has lots of medicinal properties also; apply it on razor burns, wounds and burns to get quick relief. -	Drink Aloe Vera juice to get relief from constipation and IBS (irritable bowel syndrome). -	Some reports say that Aloe Vera juice can also reduce blood sugar levels in diabetes and can repair elasticity and collagen in the skin and joints. To extract fresh Aloe gel from your indoor Aloe plant is very easy. You just need a sharp knife, clean work surface and container to store the gel. -	It is good to use outermost leaves which are more fleshy and green in comparison to young leaves. Cut the leave with the help of sharp knife from close to the base and away from the center of the plant rinse the leave thoroughly under running water. -	Cut the edges of leave and Slice off an outer leaf of an aloe plant to extract gel. Peel the skin and flip it with the gel side facing upward. -	Scoop out this gel with the help of spoon. You can use this freshly extract gel in the way you like or store it for further use in refrigerator. Aloe Juice has lots of medicinal properties; many of us buy it from market but you can prepare fresh Aloe Vera juice if you have Aloe Vera plant at home. Extract the Aloe Vera Juice from the above process and blend two tablespoon of it with fresh orange or grape juice in a mixer and served chilled.